Just Who Do They Think They Are? Copyright 2006-2011. All rights reserved. Amy Stewart, Michele Owens, Elizabeth Licata, Susan Harris. I was pretty excited to report on new guidelines for sustainable federal properties, but wondered how enforceable these guidelines are and promised to try to find out more. I did. It's a bit discouraging. I talked with Ray Mims, the point guy on pulling together input from 31 agencies and 13 consulting bodies to produce the guidelines. Interesting guy. Peace Corps volunteer in Nepal, then - get this - salesman for Dow Chemical. That gig prompted a big career change and a return to school. Now a conservation horticulturist, Ray has worked for the Denver and Atlanta Botanic Gardens and the National Cathedral here in D.C., and currently heads up sustainability projects as part of his job with the U.S. Botanic Garden. Asked how much effect the guidelines would have, Ray answered "Hopefully a lot", an answer we can't exactly take to the bank. But all agencies have goals for sustainability, and now they can use good landscape practices toward that end. Here's where it gets discouraging - asking whether Ray or his bosses at the Botanic Garden have any say-so at all in whether federal agencies implement these guidelines. Well no, because the Botanic Garden is part of Congress, not the executive branch, and only the executive branch can implement this stuff. Ah, government. I keep remembering why I've never worked for one. So this fabulous product is a guidance, not a directive. It's not enforceable. But hey, at least this whole effort came directly from the White House. Ray gave me a little more hope with the news that the people in charge of most federal buildings - the boringly named General Services Administration - are early adopters of Sustainable Sites standards - they're already using much of it. And the Park Service, in their design competition for redesigning the National Mall, required that competitors follow these the new guidelines. In Denver, the top Park Service person is using the guidelines already. Change is happening, though not all of a sudden, by fiat. The goal is to change the whole damn marketplace, not just new federal courthouses and office buildings. Taking the long view, changes in landscapes make good business sense. Developers wants their properties to be "green", to be LEED-certified, and now finally (thanks to SITES), points toward that end can be achieved through good landscape practices. And as Ray points out, buildings, as they age, just get less and less efficient while landscapes get more and more productive in providing eco-services. Plants rule! Not to mention that points for landscape practices generally are less expensive to achieve than through building practices. So economics are on the side of green. Don't forget that Ray and his colleagues created Landscape for Life for the home gardener. Coming soon are PowerPoint presentations about that for use by schools, garden clubs, Master Gardener groups, etc., and sustainability guidelines for still more types of landscapes - around schools, historic homes and cultural institutions. All good. Never having taken a White House Garden tour before, I was expecting long lines and lots of hassles, but instead was greeted with the sound of this military band, and NO line at all (thanks to early arrival). Other symptoms of a very happy experience included welcoming staff and volunteers everywhere, fast security screening, and glorious weather. There were iconic photographs taken on the grounds everywhere, causing my history-loving companion to linger. And linger. Below, clockwise from upper left: presidential helicopter on South Lawn, Caroline Kennedy on pony following her dad into the West Wing, the "Beer Summit", and an accidental landing from - I didn't catch the year. This shot into the Jacqueline Kennedy Garden over a sea of mums is for James. There were indeed gobs of mums, and they looked terrific to my eyes. Sadly, visitors weren't allowed to go into this garden or the Rose Garden, as they had on previous tours - because of bottlenecks, I was told. Bummer. The Rose Garden, with the West Wing in the background, from as close as we were allowed to see it. Above, note the putting green in the foreground. There's also a tennis court, now showing the telltale yellow markings of a half-basketball court. And on the right, where presidents once played horseshoes, is the Obama girls' play set. I couldn't resist these adorable kids beaming for their parents. How about these floral details on the south facade? My friend the Erik Anderson the architectural conservator spotted and photographed them. Next, the famous Kitchen Garden, which was looking fine and sporting its own weather-monitoring equipment. Top gardener Jim Adams was on hand to answer everyone's questions about it. I asked if the broccoli he's pointing had been attacked by cabbage worms (like most of my fall crops) but no, his were spared. And he does absolutely no spraying, not even with organic pesticides. Finally, the fountain on the South Lawn is no longer surrounded by bedding annuals (seen here), but by Knockout Roses. Not the artsy choice some would prefer, but low-maintenance, and crowd-pleasing. For more of my White House Garden photos (only one duplicate) click here. A guest rant by Mary Gray. Observe, if you will, your local public school. Not the inside. No, take a look at what’s going on outside -- on the school grounds. A place that could be put to good use for the students and faculty but that just languishes empty and lifeless throughout the seasons. It shouldn’t be this way. Picture if you will a school where the potential of the GROUNDS is fully realized. A place where student clubs and vocational classes design, plant, and maintain beautiful school landscapes that include flowering trees, shrubs, and perennials. And in doing so, they learn about design, botany, teamwork, and sweat. Where a portion of the playing fields are given over to natural playscapes, filled with an array of plant life, where kids could play tag among the trees or observe a butterfly in the act of pollination. And minds as well as bodies are exercised. Where science teachers help their students design and build a rain garden, or a planted swale. And everyday, students see how something they built has made their environment healthier and more beautiful. Where English teachers lead students out of their cinder-block classrooms and into the open-air to enjoy reading Walden or Leaves of Grass the way the authors intended. Where kids research and plant natives and then inventory the visiting insects and birds. Where seeds are planted and harvests reaped, both literally and figuratively. So am I just a crazy dreamer or are most schools wasting what could be an incredible inspiration and resource for learning? School grounds offer an array of educational opportunities for creative teachers, administrators, and parents, and it’s the kind of learning which would exercise not only the mind, but the body, the imagination, the senses. So what are we waiting for? The floral preferences of the Obamas. White House Floral Designer Laura Dowling's "garden" style. It's more relaxed, with lots of unexpected touches. The exciting Top Florist-type competition for the job. The role of flowers in the lives of everyone living in and visiting the White House. Like the "transition of flowers" on Inauguration Day, and a floral gift of friendship to Carla Bruni-Sarkozy. How floral design at the White House has changed over the years. Dowling's bio, including years in Paris and a high-powered Capitol Hill husband. Garden designers and gardeners alike are happily predicting a similar transformation in the gardens around the White House - because it's high time. Click here to see why. "Governor's mansion model of ecological sustainability"
That's the title of Mackenzie Carpenter's great piece in today's Pittsburgh Post-Gazette about the gubernatorial gardens in Harrisburg. Nice to see some well-earned kudos for the horticultural team taking this high-profile garden very seriously and setting a great example for Pennsylvanians. I wrote about the gardens here for Green the Grounds and was also impressed with Dennis Rydberg's oversight of the gardens. He sent me these recent photos of the rose garden and the brand new kitchen garden. Forgot old-style, formal landscaping for the governor's grounds in Harrisburg, PA; they're way cooler than that, as you can see by these photos. The 3.5 acre-site have been transformed by two serious gardeners - Tom and Michele Ridge. Working with a 12-person committee of experts, they transitioned the landscape to something more usable, sustainable and educational by adding a native plant garden, plus super-sustainable plants from everywhere for the other gardens. A super-smart irrigation system was installed, and - amazing to me - they now let the lawn go dormant during periods of drought. Brown grass in this high-visibility, official site? Wow, maybe there's hope yet for changing our crazy American expectations for a perfect, always-green lawn, water conservation be damned. So with a native-plant garden and vegetables, what more could anyone want, right? Some folks (yours truly) might suggest that the elephant in the room is the harm that's done to our waterways by dumping fertilizers and pesticides on our lawns. 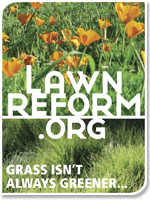 So while these changes in Harrisburg are really, really commendable, there's one more important step that needs to be taken - ending the practice of using a synthetic fertilizer to "green up" the lawn in the spring. You know, when it's most likely to run off into the Chesapeake Bay. I spoke with the guy in charge there - Dennis Rydberg with the Penn. Department of General Services - who was very helpful. He's very aware of the issues and predicts that feeding will soon be transitioned to fall. Naturally I nagged him to go that last step - switching to slow-release sources of fertilizer, or feeding using such harmless sources as grass clippings, corn gluten, clover and compost. Hey, come to think of it, in my research about governors going "green" with their grounds, I have yet to hear of anyone going organic in their lawn care, giving up the petroleum-based fertilizers that contribute to dead zones in the Chesapeake Bay and other bodies of water we care about AND destroy the life in the soil. (It's crazy!) You know who HAS gone natural, though? The National Arboretum stopped putting anything on their lawn three years ago and since then has saved 90% of their yearly lawn care expense. That savings probably includes reduced water usage, since they stopped all watering except for a small area that's seen up-close. Photos thanks to Dennis Rydberg. Just got home from the gardenblogger event in Chicago and find that I need to say a bit more about the previous post. - I think it would be great if all governors had veg gardens, but the mission of Green the Grounds is to draw attention to all those other gardening issues, like lawn care that doesn't drain resources or kill our bays and lakes. Like making landscapes more wildlife-friendly. - The Republican governors I was referring to are Ehrlich in Maryland, Taft in Ohio, and Sanford in South Carolina. In the case of MD and OH, they're gone and the current Democratic governors have kept the changes intact. - A bit more about Ohio: Because neither of the Stricklands are gardeners and Hope Taft had created such wonderful gardens, Frances Strickland appointed Taft to head the on-going direction of the gardens and in that role, she continues to crusade for the cause, especially for native plants. Taft recently convinced the gang there in Columbus to become a supporting organization of Green the Grounds. - It was a paper in NC that called for Gov. Perdue to grow food, not this blogger. - While I'm at it, you saw Maryland's First Lady in the last post. Now check out our governor, rock musician Martin O'Malley. Y'all, I'll go out on a limb and just declare him America's Hottest Governor. Til you prove me wrong. Governors climbing on the veg-growing bandwagon. Is that all? Also predating the White House veg garden are those in Ohio, South Carolin a and Arkansas. 2009 additions to the veg-growing movement are governors in Maryland, Pennsylvania and California, with another one in the planning stage for Maine. New York has an plan for greening their mansion that includes "ecologically sound grounds maintenance". We hope to see that single quote fleshed out with details, though. One Georgia blogger, another Eat the View follower, is petitioning the governor to install a veg garden. One North Carolina newspaper has called for their governor to do the same. Consider two recent examples. Sure, it's great that California First Lady Maria Shriver started a veg garden on the grounds of State Capital Park, but when her press secretary called to tell me and found himself being asked about all those other issues - water, pesticides, wildlife - he had no answers. I was told that their horticulturist would call me but it's been a month now and it ain't happening. Then last week Pennsylvania's Governor Rendell announced HIS veg garden in Harrisburg, touting how "green" he is - great! But do you think there was any mention of how responsibly he's managing the rest of his official landscape? Not a peep. So why aren't reporters asking? The good news here is that my own calls have yielded very promising answers, so stay tuned. Finding out they're already doing fabulous things, like Maryland's last governor. He had a cool horticulturist in charge, got the property Bay-Wise-Certified, photos were taken, and the guv looked like a big green hero! OR these issues have never occurred to your governor or anyone on his or her staff - til you asked. They say, "We'll get back to you," and lo and behold, there's a big eco-friendly plan announced! Probably including a veg garden for good measure - even better! They may even go the way of Ohio and use their grounds to demonstrate and honor the state's natural history, among many other fine objectives served by Ohio's Heritage Garden. Whatever you may know or find out about your governor's mansion grounds, let me know! And send them the Green the Grounds link. Photo: Maryland's First Lady Katie O'Malley helps plant a veg garden on the governor's grounds. Ohio Governor's Grounds - Greenest of all? In honor of Earth Day and to help launch Green the Grounds, here's a profile of the "greenest" governor's grounds in America (until proven otherwise) - in the great state of Ohio. My own state of Maryland is profiled on my blog. Re-creations of Ohio's natural ecosystems - an Appalachian garden, a dune garden, woodland, bog, Pioneer Garden, a home for wildflowers rescued from developments, ponds with turtles and frogs, examples of Ohio's native geology. Not to mention a clone of an actual Johnny Appleseed tree - old Johnny's a big part of the state's plant history. And there's still room for a vegetable and cut flower garden. But Taft didn't create just ANY ecological demonstration site, but one that still looks grand enough for its official duties. For example, its "formal prairie" demonstrates that formal design and naturalistic/native plant choices can go hand in hand. And there's still a place for lawns and rose gardens and traditional bedding plants, too - all of Ohio's horticultural traditions are included. How'd she do it? Well, by bringing together her friends, Taft told me in an interview. Like landscape architects, botanists, Ohio's Department of Natural Resources and lots of others, known around the mansion as "Hope's Army". To parley her transformation of these 3.5 acres into a landscaping revolution across the Buckeye State, Taft and her team spread the word through tours, an eco-lecture series at the residence, and a book, Our First Family's Home, published in 2008. And when the National Governors Association met in Columbus the governors' chiefs of staff were given a tour of the garden and, according to one source, their reaction was: "Duh! Why NOT use governor's mansion grounds to demonstrate the state's natural history?" There's no tally of how many governors' grounds were actually changed that day, but at least the seeds were sown. Perhaps most impressive of all is Taft's ingenious plan to take the message on the road. Ohio's Master Gardener Volunteers are trained as "ambassadors" for the Heritage Garden, then given CDs of PowerPoints about the garden and its message that they show in their own counties. The corps of ambassadors are then invited back for updates and lunch, which goes a long way to keeping them informed and passionate about the message. Check it out. Under "Heritage Garden" you'll find a virtual tour, plant database, physiographic regions of Ohio, sources of native plants and seeds, and those lectures at the garden (primarily on the topic of Ohio's native plants). Alice Waters pestered one president after another to start a veg garden at the White House and, with help from Michael Pollan and the tireless Roger Doiron and his amazing Eat the View campaign, she finally got her wish. So now there's not just a White House veg garden but a billion or two news stories about it (with trillions more coming over the course of the Obama administration), and California's First Lady has already jumped on the veg-growing bandwagon. And we're all pleased as punch about this but hey, what about the rest of those 18 acres? What about getting that lawn off drugs? Ditto those sickly hybrid tea roses in the famous Rose Garden. How about more wildlife habitat on this precious center-city site? And then there are the unsexiest concerns of all - stormwater run-off, water conservation and recycling of green waste. YOU all know the issues, but who's talking them up with the media? NO ONE. NOT A PEEP. All that brings us to - ta-da! - a national media campaign called Green the Grounds.org. Mission: To encourage the Obamas and America's governors to green the grounds around their official landscapes. Why? Because just as Michelle's veg garden will teach Americans more about food than any other government or private action possibly could, the same could be accomplished with a White House compost bin, organic lawn, habitat garden and no-spray Rose Garden, with similar improvements to official residences across the U.S. Imagine!! If we get even HALF the media attention that Waters, Pollan and Doiron did with their campaign about food, official landscapes will change, and private backyards will follow. Changes you'd like to see to the White House grounds. Changes you'd like to see to the grounds of your governor or mayor (if there's an official residence in your city). Examples of sustainable, eco-friendly landscapes that you know of. Your ideas about how to spread the word. One more thing - grab the Green the Grounds badge and pop it into your sidebar. This all started with a very exciting phone call from Michelle Obama's assistant to yours truly, asking about my ideas for a veg garden and saying they'd be back in touch after the Inauguration. Well, I say, in the meantime I'll pull together some suggestions. I then set to work polling everyone I know in this town and a few others around the country about not just the growing of food but...every other damn thing I'd love to see happen to those 18 acres - lawn care, reduced pesticide use, etc etc. Thirty-four consultations later, I compiled it all in an "informal proposal" with some gorgeous photos and delivered this largely unbidden advice to the White House. Click here for a summary of the proposal and another link to the 19-page proposal itself. The 34 smart people whose brains I picked are listed on the last page. Robin Wedewer's garden adorns the cover. Gardeners and foodies, great news from the U.S. Department of Agriculture! On the 200th birthday of Abe Lincoln - he founded the USDA, ya know - Secretary Vilsack "broke concrete" on a People's Garden at their headquarters in downtown D.C. One part of the project is returning 1,250 square feet of unnecessary concrete to lawn and believe me, focusing on the problem of impervious surfaces here in the city is great news to the environmental community. The other part of this People's Garden is a 612-square-foot vegetable garden that will be tended by USDA volunteers working with folks from Melwood, a nonprofit that "empowers people with disabilities." Produce from the garden will go to the Melwood gardeners and to D.C. food banks. But there's more - Vilsack is directing ALL USDA facilities around the world to assess their sites for potential greening measures, to include vegetable gardens, reduction in impervious surfaces, roof-top or window box gardens, native plant gardens - you name it. So I imagine we'll be seeing lots more encouraging press releases throughout the year. It's just begun, folks! Now am I the only one who sees potential here for educating the American public? There's this quote from that press release: "The garden will showcase conservation practices that all Americans can implement in their own backyards and green spaces." See? Oh, and I forgot to mention that Michelle Obama paid a visit to the USDA headquarters last week and declared this People's Garden a "good thing." So can the greening of the White House grounds be far off? I think not! Elsewhere within the bowels of the bureaucracy, there's been a rather quiet movement under way for years now to green-up the buildings and grounds of the federal government. Led by whom? The agency you've probably never heard of - the General Services Administration, the folks who acquire and manage federal facilities. Unsung, uncool, but green as can be. Asked when Obama said he wanted to green the White House, I did one quick Googling to find this article about that interview - with Barbara Walters. He kinda says yes, but then only talks about energy use. But this looks interesting - there's a "Greening the White House Report" ordered by Clinton and done by the Rocky Mountain Institute, no less, and the link's in that article. Let's see if they mention those 17 acres of land at all. The article mentions just one - switching to "smart sprinklers." Greens of the plant world - gardeners of all types - it's time for us to speak up about the improvements we know are possible - at the White House and in the backyards and frontyards of America. At the White House, it's time to Green the View! On tours at the White House, one can see flowers such as tulips, hyacinths and chrysanthemums in the East Garden. Plants that can be seen in the Rose Garden include magnolia trees, Katherine crab apple trees and a variety of roses. The tons of herbicide and petroleum-based fertilizer previously dumped on the turfgrass have been replaced with a yearly application of compost and two applications of compost tea. This switch to organic lawn care has increased the lawn's drought-tolerance and saved thousands of gallons of water previously used to keep it green all summer. Dozens of native plants have been added to the White House gardens, which now include a Butterfly Garden and an educational Habitat Garden, all enjoyed by the Obama family and local school groups. Birdhouses adorn many trees on the property. All yard and kitchen wastes are composted on site. Steps have been taken to stop runoff of rainwater into the city's already overwhelmed stormwater management system that rushes pollutants to the highly degraded Chesapeake Bay. The National Park Service is making it all run smoothly and partners with local groups to spread these practices across the District of Columbia. And members of the Obama family are often seen tending their favorite White House garden, the newly installed vegetable garden. Produce from this "Victory Garden" is used in the White House kitchen, and the garden is similar to what millions of American families could be doing in their suburban and even urban plots. To help bring some attention to this comprehensive vision for greening the White House grounds, I'm sending this post to all the local green groups in D.C., all of which stand ready to help in any way they can to make the transformation a big success. As will the food, gardening, nature and environmental media nationally and worldwide. What a platform for teaching! You can help by grabbing the permalink passing it along, too. Gardenbloggers especially, this is a great cause for us. And while we're dreaming of the White House having an environmentally responsible landscape, what about asking our governors to similarly get their acts together, landscape-wise? Their residences are also high-profile sites that could be showcases for these much smarter (and far more beautiful) practices. UPDATE: Go to Green the Grounds.org to learn about the greening of executive mansion landscapes across the U.S.